Amy: Tink's first attraction had to be "it's a small world." I love that ride and yes, even the song that you just can't get out of your head. I sing it to her occasionally at naptime. This attraction is classic Disney and what little girl wouldn't love room after room full of dolls? My husband, Dad, Chris, Audrey, and I rode "it's a small world" together after a late breakfast at 1900 Park Fare. I guess the combination of a full tummy, being comfy in Daddy's arms, and the gentle boat ride was the perfect set-up for a nap. She saw about 75% of it before falling asleep. I really appreciated Audrey's Entourage on this trip. 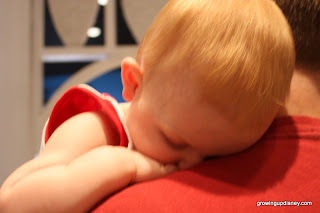 When we emerged from the ride into the bright sunlight, Uncle Chris had retrieved the stroller and Granddaddy took her off for a nap behind the Christmas shop while the rest of us headed off for Haunted Mansion. Disney.com has some great history on "it's a small world." Corby: We took our son to Disney World for the first time in September 2007. He had recently turned 4 years old. In one word the thing that stands out most to me about this particular trip is…characters!!!!! I should have known since he had a love for all things plush that seeing real live stuffed animal looking characters would be his dream come true! The other word that comes to my mind that trip is…hot! It was in the middle of September and I’m pretty sure it was at least 120 degrees! 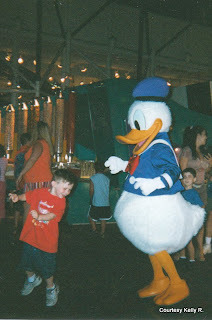 He and I waited in line after line to meet the characters. We bought an autograph book and had each character sign it and I took a picture as well. He absolutely loved it! I’m pretty sure we met every character that trip from Mickey to Horace and Tweedle Dee and Tweedle Dum! We invested in the Disney fan that sprays water and drank many frozen drinks that trip. Seeing the joy on his face was absolutely priceless and worth every moment, no matter how hot and sweaty those moments were! Heather: Our first family trip to Disney was last November around Veterans Day. We took our then 3 year-old after much planning and debating how to get the most out of 5 day trip via train from Raleigh, NC. 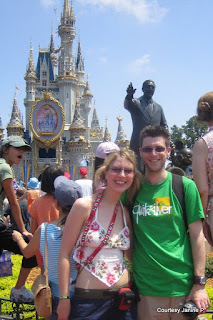 The first night we arrived at we wanted to do Magic Kingdom and let Ben see the castle before any rides. Luckily we got there in time for the early showing of the SpectroMagic parade. We found our spot along the parade route and watched his eyes light up with joy at seeing all the characters he recognized from multiple viewings of Mickey Mouse Clubhouse. He is partial to Daisy Duck so when she appeared in an array of light and waving to the crowd, his heart melted. 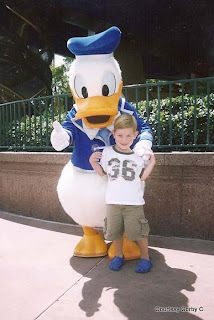 My husband have both done Disney as kids and again as a married couple but this was a very special trip to be able to see Disney through the eyes of a preschooler. We are returning with our now 4 year old and 4 month old baby in late October in time for the Food and Wine festival as well as Mickey’s Halloween party. Our 4 year-old will be sporting a pink Daisy Duck lanyard for some pin trading with Dad. We are excited for our family to experience the magic of Disney again. 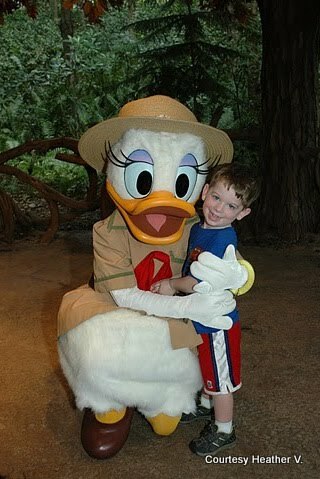 Janine: What am I most looking forward to showing Felicity (F) at WDW? Well it’s a tough choice between visiting the Bibbidi Bobbidi Boutique (BBB) at the Magic Kingdom (MK) or taking her on the Haunted Mansion (HM). I can’t even watch a video of BBB on YouTube without filling up with tears. Just the thought of my little Tink being made into a full-fledged princess for the day warms my heart beyond imagination. 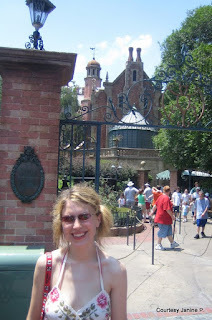 But I also can't wait to take her on Haunted Mansion as not only is it my favourite ride at MK (and of course MK has to be her first park), it was also my first ride. Thankfully Ddaddy’s first ride no longer exists (ExtraTerrorestrial) as there’s no way I would take her on that! So it’s a choice between taking her into the castle to meet her fairy godmother and be made up to look even more beautiful than she already is (and making both mommy and daddy weep with joy) or riding though the HM with our ghost host hoping not to join the 999 spectres! You may be thinking HM would be a little scary for a tot but you see I doubt we’ll be going to WDW until F is 4 and I think by then, being our kiddo, she’ll be more than ready. We love Halloween so she’ll have already seen a few ghouls and ghosties! I love the thought of sitting with her in the doom buggy and singing along as we make our way through the house. Id love to see her face when she realises we’ve picked up an extra passenger at the end! But … no, the BBB has to win as the thing I am MOST looking forward to doing with her. Just the sight of F all dressed up with glitter in her hair and waving a wand … sniff, the keyboard is going to get damp in a minute as I sit here thinking about it! Her nursery is already decorated with princess and it will be the theme of her first birthday party. So although it isn’t actually a ride or attraction this is the thing I dream about doing with F when we get to WDW, except for her first steps on Main Street of course … but that’s a whole other story. 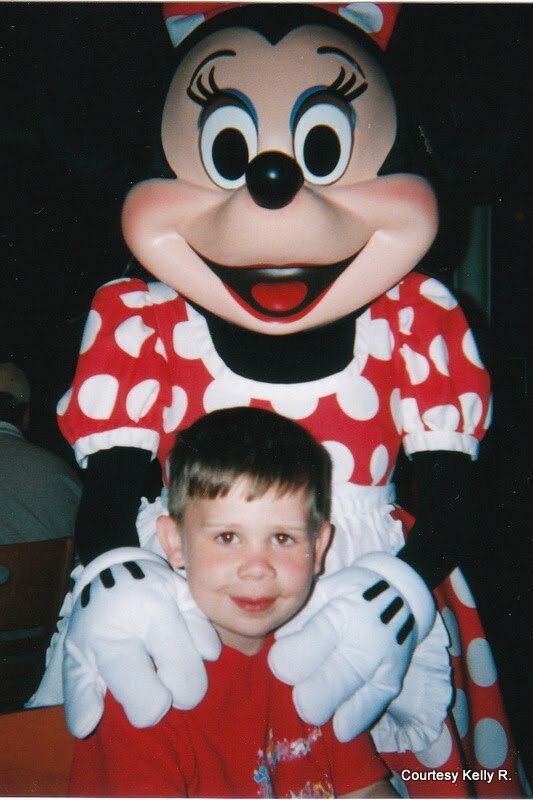 Kelly: My son Shawn’s first attraction was Buzz Lightyear at the Magic Kingdom. He was 5 the first time we brought him to the House of Mouse for a two week vacation and we had a blast. My son already loved Buzz Lightyear the character so it was not to hard to get him on the ride, add in that he could shoot things and that was all he needed to hear. We must have ridden that ride a million times over the course of the next two weeks but it was worth it! As I think back and remember it now he had this silly look on his face and was so happy to go on it over and over. At the time he was an only child and was loving all the attention but little did he know his brother was on the way. I hate to admit it but even back then he beat me a few times and now that he is 11 he beats me even more. It has become a competitive sport with my sons and husband, with my husband usually winning. I pulled out my Disney Picture Album from that vacation and pulled out a couple of my favorite pics to share and I as went through them it brought back such fond memories for me. If you have a first attraction story you'd like to share, we'd love to hear it. Please leave a comment below. fantastic article! I don't have children of my own, so it was wonderful reading a mom's views of seeing the world a child's eyes. you're indoctrinating the newest disney generation at a young age! it makes all the difference! my mother was pregnant with me the second year epcot was open, and she said she rode horizons constantly, just to get off her feet and sit in the air conditioner. I'd like to think that this molded me into the disney nut that I am! looking forward to more articles from the minnie mom's panel! I love seeing all the kids with their fav characters! Ben is in LOVE with Daisy and yes she is hard to find. We really lucked out that she happened to be making her only appearance at Animal Kingdom the time we were there so JACKPOT!